Just as the January 1 GRIs were losing traction, the mid-month round lifted transpacific prices back up again. The net impact was a 4% week on week rise for both lanes. China-West Coast went up from $2,031 to $2,110, and China-East Cost went up from $3,171 to $3,292. Having lost ground following January 1’s GRIs, the mid-month GRI picked up transpacific prices again. The net effect of dipping, then rising prices last week was a 4% week on week rise for both lanes. GRIs are sticking currently because space is tight on sailings – post-Christmas replenishment is in full swing coupled with the CNY bottleneck fast approaching. 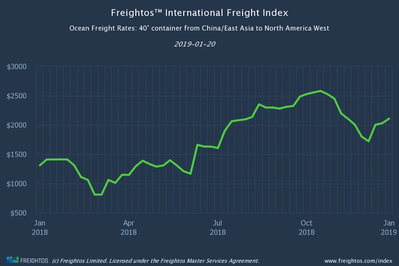 China-North Europe prices continue to rise, good news for carriers looking for high prices during that lane’s contract negotiation season. Several carriers have implemented mid-month FAK increases or fuel-related surcharges (including Hapag-Lloyd’s peak season surcharge). 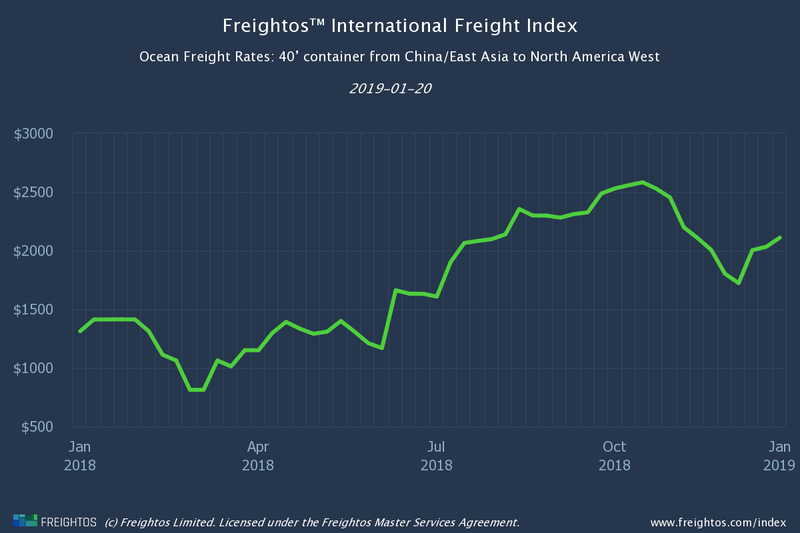 Once China returns to normal after the CNY shutdown, transpacific freight prices usually drop dramatically. Last year, between 25 February and 29 April, West Coast prices fell by 19%, East Coast by 21%. In 2015, between 26 February and 30 April, the corresponding drops were 23% and 26%. Continuing uncertainty over China trade tariffs this year, however, may lift demand and lessen the extent of the seasonal price falls.